The tutorials you will find here are free for your use and information. These free tutorials may or may not be exclusive to Soda Lime Times. It is possible you may find them elsewhere on the web. The creator of the tutorial has given us permission to include their work here. 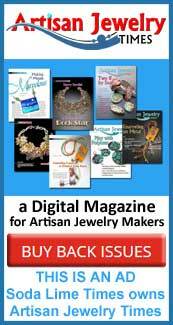 Our objective, over time, is to amass a significant library of quality, useful bead making tutorials. Those that may be accessed free of charge will be included here. Tutorials: Click on the PDF Icon or the Video Icon, as applicable, to access the adjacent tutorial. Sparkle the Owl Cute owl bead with touches of dichroic for a little bling. Thanks to Loti Peterson and her cat beads for inspiring this design. Flower Power Jawbreakers My all-time favorite tutorial for a big, bright floral. Goody Good Gumdrops A super easy gumdrop bead made from transparent glass and clear frit. Perfect for the holidays! And zero calories! How to Make a Cube with Square Sholders and Pointed Corners. Learn Heat Control. Novice Level. Sculpted Flower Bead by Lorraine Dowdle, Artisan Lampwork and Jewelery Artist. Snow Cone Bead - A great bead for kids and especially for Beads of Courage Kids. A Soda Lime Times Lampwork University Tutorial. Vine Cane Twistie - For full, rich floral or organic beads a vine cane is almost an essential. Learn how to make a vine cane twistie and stringer in this tutuorial. Falling Leaves Necklace - In the December, 2011, issue we show how to make wonderful pressed leaves. Use thoes leaves to make a stunning necklace. It is easy, and the result, we think, is terrific. Twisting It All Up - A special tutorial by one of our favorite contributors, Kris Schaible. Kris shows her method for making twisties using a tool she and her husband developed. 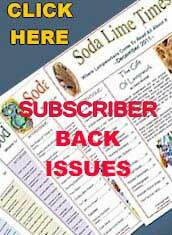 The tutorial may be downloaded for free and there is a special offer on the tool until April, 2013, just for Soda Lime Times visitors and subscribers -- that is you. 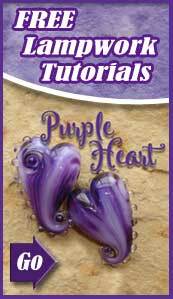 Striated Encased Purple Heart Lampwork Tutorial - A fun way to use frit to make a heart focal bead with a horizontal hole. From the Dec. 2016 issue of Soda Lime Times.